Estas ma﻿gdalenas están deliciosas y se cocinan en un momento. 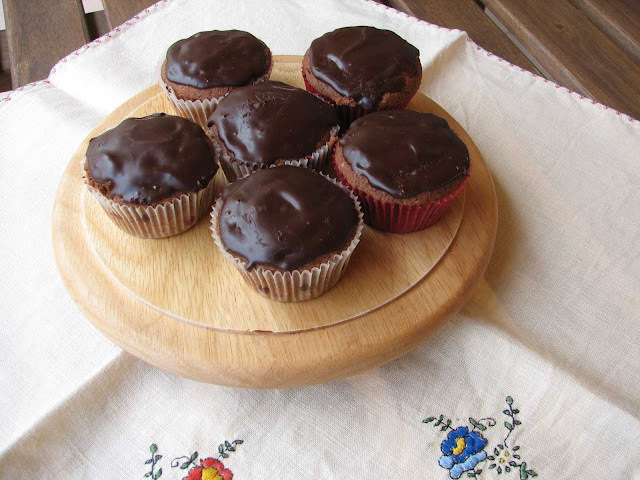 These cupcakes are delicious and are cooked just in a short time. 1- Precalienta el horno a 160º y coloca 12 moldes de papel para magdalenas en una bandeja refractaria. 2- Bate la mantequilla derretida con el azúcar en un bol y cuando obtengas una masa cremosa añade el huevo. 3- Sin dejar de batir agrega la leche, el cacao, la vainilla y la harina con la levadura. 4- Rellena los moldes con la mezcla obtenida y hornea durante 15 minutos. 5- Funde el chocolate troceado a fuego lento o al baño María junto con la nata y cubre las magdalenas cuando se hayan enfriado. 1- Preheat the oven to 160 ºC and place 12 paper cups on a baking tray. 2- Beat the melted butter with the sugar in a bowl and when the mixture is creamy add the egg. 3- While constantly stirring, add the milk, the cocoa, the vanilla and the flour with the yeast. 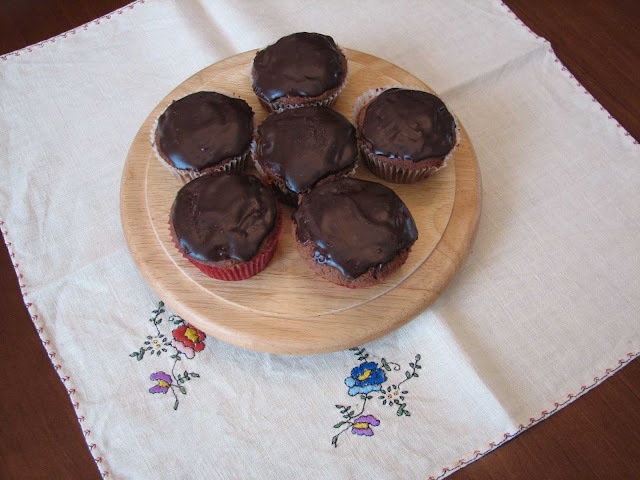 4- Fill the cups with the obtained mixture and bake for 15 minutes. 5- Melt the coarsely chopped chocolate on a low heat or in bain-marie with the cream and cover the cupcakes after cooling.